Kremsmunster. Benediktinerstift. Stiftsbibliothek. CC391. Sammelband. This model is based on a specific exemplar from the Kresmunster Benedictine monastery located in Upper Austria. CC391 is a breviary including local rites that was written and bound in the same location at the scriptorium and bindery at Kresmunster monastery. The binding dates to <1486 where it was “written between the establishment of this [local religious] holiday and the canonization of St. Leopold, (Smith 109). During this time period and location, texts shifted from primarily being about the lives of saints to including “philosophy, theology, and church law,” (Smith 109). Hence, CC391 contains an assemblage of information. The girdle book structure was in common use from the 14th-16th centuries all across Europe. 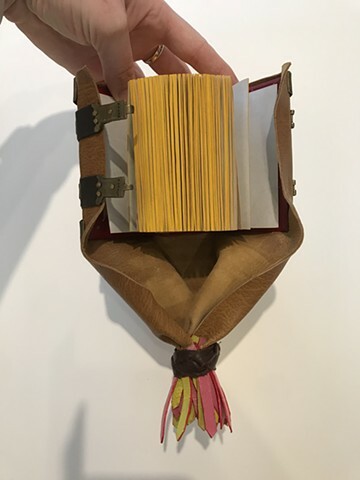 While only 26 medieval girdle books have been identified, the girdle book image can be identified in over 800 items suggesting it was a common object that writers, painters, printmakers, etc. could easily recognize and creatively represent (Smith 30). Girdle books were used as everyday objects that could be worn and read from one’s belt or girdle. Smith defines the girdle book use as: “most often a utilitarian book and was not primarily produced, intended, or used as an ornamental accessory [...] girdle books fulfill several functions, those of protecting the book, providing easy portability, and giving immediate access to the required text, while at the same time occasionally offering some blank pages for notes as needed, and preventing loss or theft of the book when attached to a belt,” (Smith 2-4). Of the 26 girdle books Smith identified, there are nineteen with religious content, five with legal content, and two with philosophical content. This range in content is appropriate since the books were so utilitarian. Smith identifies several artworks of medieval travellers wearing girdle books: Pynson’s woodcut of the friar in Chaucer’s Canterbury Tales and St. James the Greater in Bosch’s painting. In these visual representations of the girdle book, girdle books are “most frequently used as a symbol of learning, intellectual inquiry, faith and standing in the Church and one’s community,” (Smith 25). However, owning a girdle book in the medieval ages was not seen in a positive lens by all peoples. To some Protestants, the girdle book was a symbol of Catholic indulgence, a symbol of wealth, and: “considers the girdle book a sign of the decline of the discipline within the monastic orders and the increase of the general decadence of priests and monks, who are more interested in what required less effort and provides added comfort to their lives,” (Smith 25). CC391 certainly indulges with decoration that some Protestants may have viewed as decadence such as: multicolored fringe, all of the metalwork pieces, completely decorated interior, colored edge, etc. A 1515 girdle book printed in Venice. This book shares quite a few similarities with the Kremsumster manuscript: both have extensions that end in a Turk’s head knot with fringe, bright red leather wrapping around the boards on the inside, the same corner pieces, center bosses, and clasps. -- Halle an der Saale. Universitatsbibliothek. ThSGV 3148. Gebetbuch der Klarissin Anna Heugin. One-cover book with primary bindings and protective flaps along the top and fore-edge. Kresumuster manuscript CC391 was made with parchment and included some early etchings printed on paper. The parchment varied from 0.16 - 0.25 mm thickness. Due to lack of resources, I used a thin handmade Indo-Islamic paper instead of parchment for the majority of the model. I treated the paper with egg-white sizing and burnishing to capture some of the similar touch-qualities of parchment. My paper thickness is a bit on the thin side of the original manuscript in order to model manuscript’s spine thickness. Instead of containing 183 text leaves, this model has: 264 leaves. The front and back signatures are constructed with handmade parchment to suggest the original materials of the manuscript. The parchment is not high quality which would have been appropriate for the endsheets but not high enough quality for the manuscript pages. Manuscript: Smith describes the sewing as “constructed on five double alum-tawed thongs 5 mm wide, and is sewn all-along,” (Smith 116). She mentions that the endbands are no longer intact but there are remnants of a 3mm alum-tawed core. Nearly flat spine, covering material adhered to the spine, parchment liners. Smith later mentions there were kettle stitches across the spine that were at some point repaired and the sewing was integral. Model: 5 split alum-tawed supports with packed sewing. CC391 had been rebound with trimmed edges. It’s possible the manuscript was originally longer with room for kettle stations and integral sewn headbands. However, in its current state, there isn’t room for kettle stitches and the endbands are not longer in place. It’s difficult to say how much larger the manuscript would have been. Because of this, I chose to sew the 5 supports all-along and packed without a kettle station. I ran out of parchment and used a thick brown paper instead for the parchment liners. In hindsight, since the first leaf is not a pastedown, I should have used parchment instead. Eventually, this liner will be pasted down onto the board and and illustrated pastedown will cover it. The endbands were sewn bead on front and enter the textblock just above the last thong. I chose to sew with alternating pink and white silk thread color to match the alternating pink and yellow fringe. Since the paper edge is dyed yellow and there is a bright red leather wrapping around the board, pink and yellow seem to flow nicely together. Manuscript: The edge was cut with a draw knife and dyed/painted with yellow edging. Marigold may have been used as a natural yellow dye. Model: Trimmed on the plow and colored yellow with modern gouache. I prefer the cleancut a plow creates and there is a possibility the edges may have been originally trimmed with a plow and later cut down with a draw knife after rebinding. I wish I would have been able to naturally dye the edges but was not able to do so at the time. Manuscript: “214 x 79 mm including the extension, is 62 mm thick, and weighs 300 g. The leaves are 83 mm high and 64 mm wide and without the boards the book-block measures 45 mm” (Smith 110). Model: 242 x 73 mm including the extension, 54 mm thick. The leaves are 93 mm high and 65 mm wide and without the boards the book-block measures 37 mm. The dimensions are a bit off because the manuscript has been resewn and trimmed; I added some height to accommodate. The handmade paper is pretty malleable and while it was the 45 mm thick after binding the textblock together (and after adding quite a few more leaves than were in CC391), after putting it under weight and clasping the boards together, the textblock lost some of its intended thickness. Image reference: Diagrams of various board attachments (Szirmai 223). Manuscript: “The boards are 5 mm thick (measured over the leather) and are beveled to 3 mm on all inside edges; only the outer spine edge is chamfered. According to Szirmai, the boards are beech wood. They are laced on over the board edge, but further details are obscured with the pastedowns. At the head, tail and fore-edge the boards produce a square of 4 mm,” (Smith 116). Model: I used quarter-cut 4mm birch wood boards. After adding the thickness of the two pieces of leather wrapping around them, they are ~5 mm. I used a hand planer to cut a 3 mm bevel on the inside edges and a file for the outside chamfered spine edge. The interior beveled spine edge suggests the book would have fit into a natural round instead of having the flattened spine it has today. I rounded the spine of the textblock because of this. According to Szirmai, lacing paths e / f and disposition G were found in Hungarian and Austrian books. Szirmai did not include book locations for disposition F but describes it as showing: “the best economy: five supports (and two endband supports) require only three holes and dowels,” (Szirmai 224). Since CC391 was Austrian with 5 supports and 2 endbands, I chose to do disposition G with and alternating distance from each attachment like in disposition F. Due to the close proximity of each support, the backboard started to split. I believe disposition F would have been a more likely disposition candidate and may have prevented the splitting. Manuscript: Instead of pasting down the first page of the textblock to the front or back covers, there are unattached paste-downs on the covers. Upper: painted miniature on parchment of Christ sitting on a rainbow in a sky of fire with a partially gilded background. It is 75 x 55 mm with a green silk curtain attached to the top of the miniature for protection. Lower: a paper etching of the crucifixion with Christ in the center, Virgin on his right, and St. John on his left. Both red turn-ins of the each cover “surround the print by about 5 mm and compliment the red letters in the facing page,” (Smith 116). Model: I have yet to paint and draw each of the inner cover paste-downs but am planning to have them completed before the Girdle Book show in May. Manuscript: Red leather covers both of the boards’ head, tail and fore-edges with even turnins. These were produced with 2 strips of leather where there are 2 mitered corners and two medieval tongue shaped corners. Chemise: may have been dyed yellow or pink (possibly pink on the exterior and yellow on the interior). Model: I used a thin garment leather already dyed red and pared it down. I used two strips and treated the corners with two mitered and two tongue shaped folds. The chemise is an undyed natural brown color. 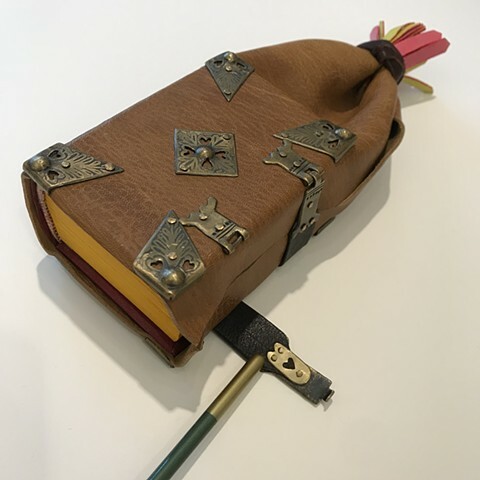 Manuscript: The cover and spine would have been decorated with leather tooling. Model: I chose to forego the tooling for this model. Manuscript: “Still attached to the fore-edge are 14 complete page markers, and remnants of three broken ones. Made of leather folded over the leaf edge, they are 4-5 mm wide, 8-10 mm long, 16-20 mm long when unfolded. Their shiny surface could be a gilded or bronzed finish,” (Smith 110). Model: The model does not yet have page markers. I want to add them once I begin adding imagery into the girdle book. However, I am considering making the page markers now and adding them into the book and having those areas be the first ones with imagery added. Manuscript: Centerpiece: 25 mm with a boss of 6 x 1 mm, attached with 2 brass nails. Corner pieces: legs measure 15 mm, furthest point at 27 mm, attached with 1 nail 1.5 mm from the tip, crimped 4-5 mm over board edge and nailed into the edges. These corner pieces were found on other books and may have been mass produced. Model: Centerpiece: 22 mm with a boss of 6 x 1.5 mm, attached with 2 brass nails. Corner pieces: legs measure ~15mm, furthest point ~27mm, attached with 2 nails, one ~4mm from the tip and the other ~20 mm from the tip, crimped 4mm over the board edge without nails. The corner piece nailing variation is because I only had access to larger nails. I was worried they would split the edge of the board and instead of nailing them into the sides, nailed two onto the face of the corner piece. The larger nails needed to be placed a bit further away from the tip of the plate for stability. Manuscript: Catchplates are butted up against the corner pieces on the front board. Anchorplates were sheets of brass of uneven size attached with two nails each. 17 mm of board was rebated for strap depth. Straps are a dark brown. The original straps were most likely 16 mm wide. The leather strap thong is held between the clasp and backplate with three nails-- two through the metal-leather-metal, and one nail through metal-metal. CC391 has thick thongs. Durfeld mentions how these led the Germans to design their thong attachments: the “commonly thick thongs had forced the Germans to find a different design of clasp and another way of attaching it to the thong. In all those few cases, where Germans did employ the technique of first folding a strip of brass into half and then cutting out its shape, the clasp is fitted with an eye that hooks onto the catchplate with a pin [...] All other clasps are usually worked in thicker brass and their things riveted onto them with a backplate,” (Durfeld 73). Model: I made a mistake by attaching the catchplates on the lower board. To accommodate this mishap, instead of using plain brass pieces for the anchorplates, I replicated the catchplate design (minus the piece a hook would catch into). I misunderstood how the straps would attach and did not rebate the wood to accommodate strap depth. Although this is an Austrian binding, it does share similarities with other German bindings. Durfeld identifies the clasp designs as German and notes: “All German metal fastening mechanisms, regardless of the type, close from back to front. Hence, in the case of metal fastening mechanisms with leather thongs, the cover plates are put onto the lower cover which might have been considered a too inconspicuous place for wasting decorated, and this the more expensive cover plates on them,” (Durfeld 47). Even though I made the error of attaching the catch plates on the lower board, the model follows a German-style of catch plate and clasp attachment. I cut out a heart on each of the metal plates that attach the strap to the clasp. 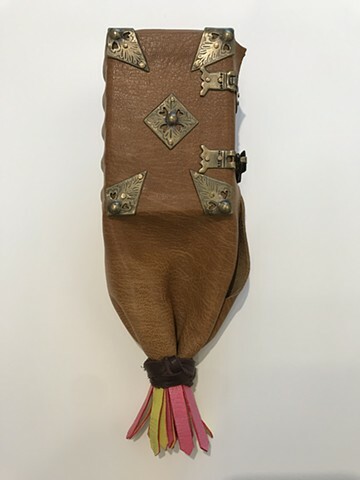 While these pieces would not have been traditionally decorated, I felt like they are an appropriate extra detail that ties together the corner pieces to the clasps. 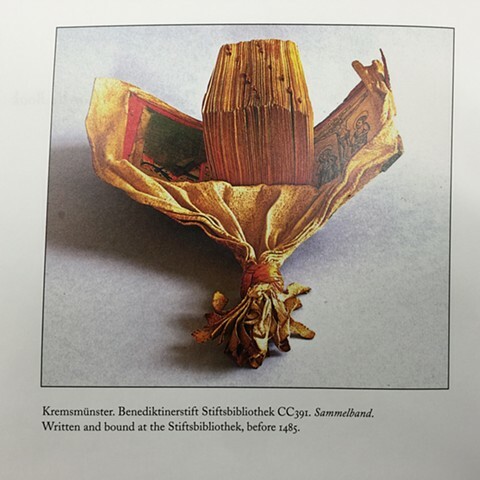 I followed the above diagram (Szirmai 252) when attaching the straps for this model in addition to observing detailed photos of the identical clasps on the Wien girdle book. Comparing the diagrams, Wien photographs, and clasp descriptions of CC319, I followed catch mechanism [b] pin. This mechanism was common in the Netherlands, North Germany, South Germany, and Lake Constance. While Szirmai did not have any examples of this mechanism from Austria or Hungary, the ones that were from those regions, [a] and [c], do not match the description of CC319. Left: diagram of a german fifteenth and sixteenth century catch plate and clasp that looks similar to the ones in CC319 and the Wien girdle book (Szirmai 259). These were common in Germany and Austria and were made in mass. Durfeld identifies this catch plate design as German from 1486 - 1545 in the diagram above (Durfeld 65). Smith suggests CC391 was created <1486 so there is a possibility these catchplates were constructed and in use <1486 or that CC391 was constructed in 1486. Manuscript: Fringe: “Some fringes show traces of red, pink, and yellow coloring, which could mean that the original color of the cover was yellow or pink, carrying out a pink-yellow, yellow-pink color scheme with bright red edging,” (Smith 117). There are 33 strips all 7.5 mm. Model:I was a bit confused with the Smith’s verbiage pertaining to the fringe. I perceived it as alternating pink and yellow stripes with a bright red edging. After painting the fringe, I realized how tedious the process was. I can’t quite imagine the binder to have gone through that process. Instead, I believe the exterior of the manuscript was dyed red where the red dye carried through the edge of the leather. The interior of the manuscript was most likely dyed yellow. Brazilwood and Lac are two natural dyes that may have been used for the red-pink color. They don’t have a great light-fastness and may have faded to a pink color leaving the edges that didnt see the light a bright red. Another possibility is that the exterior of the manuscript was dyed pink and the edges were carefully painted red to match the interior red leather around the boards. The outer covering and Turk’s head knot leather is the same on CC391. I did not have enough leather so I used a brown leather that matches the color of the straps. I learned how to read about book structures a bit more during this process. In hindsight, I wish I would have written everything that I read about the book structure in my own terms before beginning the process. While I diagramed the various components of the manuscript as I went, I believe diagramming everything before starting the project would have helped keep measurements and details more organized and the model would resemble the original manuscript a bit more. That being said, now that I understand the mechanics of putting this type of book together, I will definitely diagram and annotate book structures in the future before beginning the binding process.